Interrupting a hybrid war: new perspectives on Australia’s military involvement in East Timor in 1999. 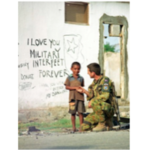 The narrative of Australia’s military involvement in East Timor (Timor Leste) in 1999 focuses on the command and sustainment of a short notice UN-mandated multi-national military intervention in September to restore law and order. Compared with what is now known about Russia’s destabilisation of the Ukraine in recent years, Indonesia’s destabilisation of East Timor in 1998/99 appears to have been a prototype hybrid war. This context adds some new perspectives to the narrative of Australia’s military involvement in East Timor in 1999.